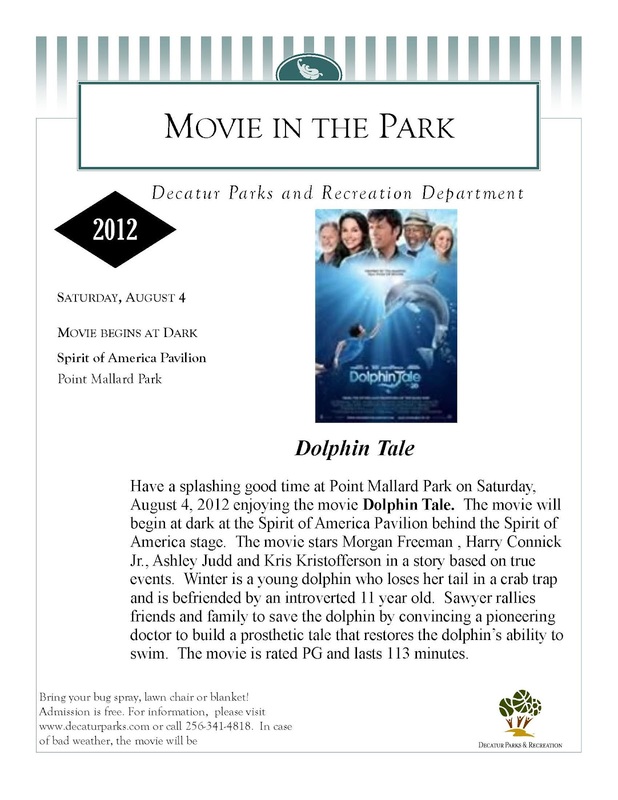 Have a splashing good time at Point Mallard Park on Saturday, August 4, 2012 and enjoy the movie Dolphin Tale. (PG, 113 minutes) The movie stars Morgan Freeman, Harry Connick, Jr., Ashley Judd and Kris Kristofferson in a story based on true events. Winter is a young dolphin who loses her tail in a crab trap but is befriended by Sawyer, an introverted 11 year old who meets the dolphin at a marine rehabilitation center. Sawyer rallies friends and family to save the dolphin by convincing a pioneering doctor to build a prosthetic tale that restores the dolphin’s ability to swim. The movie will be shown on at the Spirit of America Pavilion located behind the Spirit of America stage. All movies begin “at dark” and guests should bring blankets, lawn chairs and snacks. The free “Movie in the Park” series is sponsored by the City of Decatur Parks and Recreation Department. Efforts are made to selectfamily-friendly or classic movies for audience viewing, however, parents are encouraged to review movies in advance for appropriateness to age, content and interests. July 30, 2012 Concerts by the River featuring music from Bimini Road and SlipJig. Sponsored by the City of Decatur Parks and Recreation Department, this free concert series is held at Rhodes Ferry Park each Monday beginning in May and runs through August. Concerts begin at 6:00 PM and usually conclude by 8:00 PM. For updated schedule information, please call 256-341-4818 or visit http://www.decaturparks.com/account.php?accountid=71. In case of inclement weather, cancellation decisions will be announced after 4:00 PM on the website and on the DPR and Decatur, Alabama Facebook pages. Bimini Road visit their Facebook page or website at http://www.bimini-road.com. 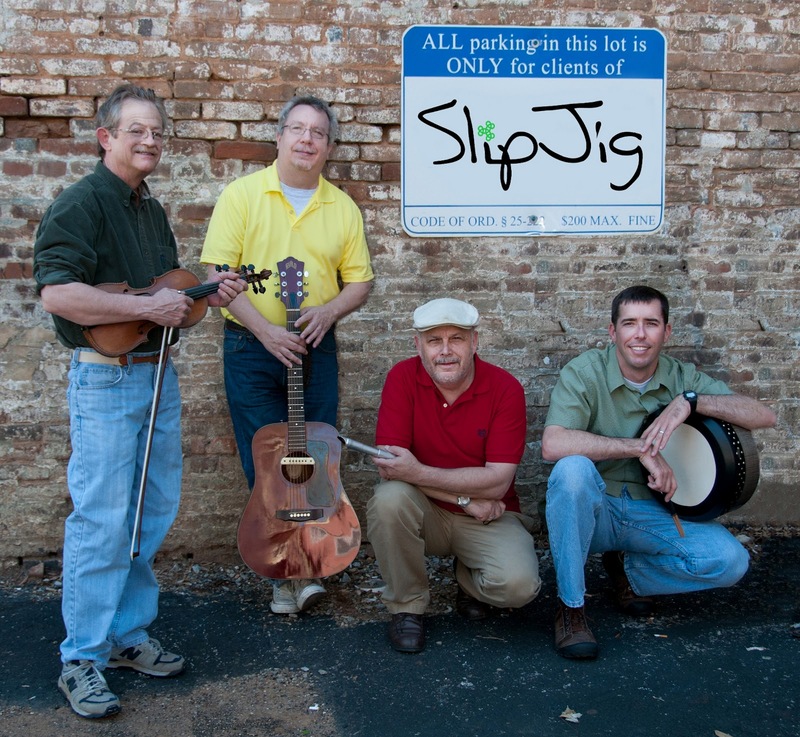 Experience St. Patrick’s Day in July as North Alabama’s own Celtic band, SlipJig, play music that truly will make the river dance! 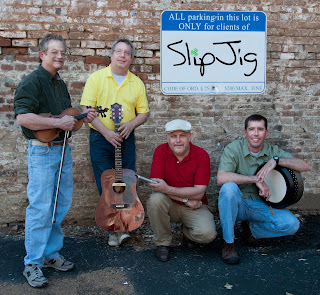 The name “SlipJig” comes from a traditional Irish dance with the band offering a wild ride through the best of traditional and Celtic music. The talented multi-instrumentalists combine tight melodies and rhythms with rich vocal harmonies to make the music of Ireland, Scotland and Cape Breton come alive. The group is composed of seasoned musicians from a variety of musical backgrounds including Classical, Folk, Rock, Blues and Jazz who have found their true passion in the Celtic music tradition that tells the stories of the joys and sorrows of a simpler life. Band members include: Mike Clem (mandolin, tenor banjo, whistles, guitar, bodhran), Andy Kruspe (Irish drum, melodica), Mike Lyon (whistles, bagpipes, vocals), and Phil Williamson (fiddle, bones, vocals.) Stomp your feet to high-energy jigs and reels, sing along with pub songs, or just close your eyes and listen to ancient airs and ballads. For more information on SlipJig, please visit www.SlipJigBand.com. Alabama Ducks Unlimited will celebrate 75 years of conservation by hosting a day-long event for the public on the banks of the Tennessee River in Decatur, Ala. Set for August 11, 2012, the 75th Anniversary Celebration and Outdoor Heritage Festival will feature outdoor related exhibitors, presentations from outdoor celebrities, live music, plus many more family-friendly activities. From 10 a.m. to 10 p.m., the public is invited to learn more about Ducks Unlimited and its conservation efforts and enjoy entertainment from special guest appearances by the Duck Commander Phil Robertson, the Sporting Chef Scott Leysath, Donny McElvoy from the “Hunt, Fish, and Cook” television show, Deke the DU dog from Wildrose Kennels, and other outdoor celebrities. The event concludes with an outdoor concert by Daryle Singletary. All activities take place at the Ingalls Harbor Pavilion located at 802 Wilson Street NW. On Friday evening at 6:30 p.m., the celebration committee will host a VIP reception. The evening includes many of the featured attendees, cooking demonstrations and sampling by The Sporting Chef Scott Leysath, and a small Ducks Unlimited raffle and auction. A limited number of tickets are available at $50 each. Advance tickets are $10 each and may be purchased online at www.ducks.org/alabama/events/. Admission is $20 per person on the day of the event. Children under six years of age are admitted free. Sponsors are Turf Doctor, Inc., Sportsman’s Pride, Omega Pride, Phoenix Roofing and Restoration, Blackridge Land Company, Morgan County Sheriff Ana Franklin, H&R Agri-Power, Joe Wheeler EMC, Lynn Layton Chevrolet, Tanksley Machine and Tool, Wiley’s Outdoor Sports, and State Farm. Proceeds benefit the organization’s mission and the future of waterfowl hunting. For more information on the 75th anniversary celebration, contact Festival Chair Chad Hughey at 256.565.4747. Ducks Unlimited got its start in 1937 during the Dust Bowl when North America’s drought-plagued waterfowl populations had plunged to unprecedented lows. A small group of sportsmen joined together to form an organization that became known as Ducks Unlimited, which is now the world’s largest and most effective private waterfowl and wetlands conservation organization. Its mission is to conserve, restore, and manage wetlands and associated habitats for North America’s waterfowl. For more information, visit www.ducks.org. Decatur, Ala. – Nothing says summer more than a fresh tomato picked from the vine, and in celebration free tomato sandwiches will be served during the annual Tomato Sandwich Day Saturday, July 28th at the Decatur/Morgan County Farmer’s Market. Sandwiches complete with white bread and mayonnaise will be given away from 9 a.m. to 1 p.m. or until supplies run out. In addition to the sandwiches, home-baked goods, flowering plants, and other locally grown fruit and vegetables, such as watermelon, peaches, cucumbers, peas, okra, and squash will be available for purchase. The Decatur/Morgan County Farmer’s Market, located at 211 First Avenue SE in Decatur, is open Monday through Saturday, 6 a.m. to 5 p.m. now through November 10, 2012. The Decatur/Morgan County Farmer’s Market also celebrates Watermelon Day on August 11th. For more information, call Farmer’s Market Manager Burl Slaton at 256.476.5595. 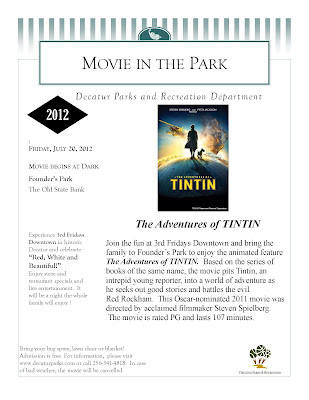 256-341-4818 or visit www.decaturparks.com. In case of inclement weather, cancellation decisions will be announced after 4:00 PM on the Decatur Parks and Recreation Department website and will also be posted on the DPR and Decatur, Alabama FACEBOOK pages. The Dixie Bluegrass Boys will get your toes tapping in their crowd-pleasing performance of traditional bluegrass music. This talented group is based out of Athens, Alabama and includes Larry Owens (guitar, vocals), Cullen Lovell (mandolin), Stephen Lovell (harmonica, vocals), Buzz Lovell (bass, vocals) and Phillip Owens (banjo, vocals). The Dixie Bluegrass Boys are well-known and respected by area bluegrass fans and have played at festivals such as Delmore Days that celebrate this rich musical tradition. Come enjoy that “high, lonesome sound” that is characteristic of the bluegrass style and these virtuoso performers. The Dixie Bluegrass Boys thrilled the audience last summer at Concerts by the River and earned a standing ovation from the concert crowd! Just Down the Road is composed of a group of friends who enjoy being together and playing great music. With influences from artists such as Alison Krauss, this Limestone-County based group is a popular performer at area events such as the Athens Fiddler’s Convention, Delmore Days and Singing on the Square. The band has also played at venues such as the Red Caboose and the Bell Buckle Café. 2012 will mark Just Down the Road’s first appearance at Concerts by the River. Decatur, Ala. – The city of Hartselle has been selected to host the 2012 Dixie Youth Baseball AA Region II World Series. Eleven teams from across the southeastern United States will travel to the “City of Southern Hospitality” to compete for the championship title July 20-24, 2012. According to Hartselle Dixie Youth Baseball League President Ashley Balch, 132 seven and eight year old boys representing youth baseball leagues from Alabama, South Carolina, Georgia, and Florida, along with members of their families, are expected at the tournament. All games will be held at the six-field Sparkman Park facility located on Nanceford Road in Hartselle. While Hartselle is not new to hosting Dixie Youth Baseball tournaments, this will be the World Series first appearance in the city. Hartselle Dixie Youth Baseball has previously hosted the state tournaments for 7-8 years old and 9-10 years old and various district tournaments. For more information call Hartselle Dixie Youth Baseball League President Ashley Balch at 256.797.0760 or visit www.hartsellebaseball.org. Gone Country at the River! The 2012 Paul Stroud Concerts by the River series, sponsored by the City of Decatur Parks and Recreation Department, has “Gone Country!” On Monday, July 16, 2012, Doubleshot will have you dancing and singing along to a rocking country beat! Concerts are open to the public and are held at Rhodes Ferry Park, with music beginning at 6:00 PM and usually concluding by 8:00 PM. 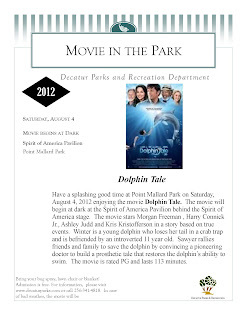 For updated schedule information, please call 256-341-4818 or visit www.decaturparks.com/account.php?accountid=70. In case of inclement weather, cancellation decisions will be announced after 4:00 and are posted on the Decatur, Alabama and Decatur Parks and Recreation Department FACEBOOK pages. The information is also posted on the DPR website. 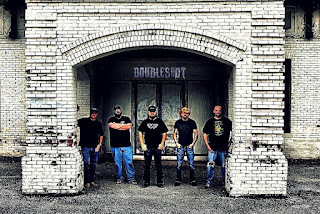 Doubleshot performs outlaw country and southern rock favorites, with influences from artists such as Jamey Johnson, Merle Haggard and Lynyrd Skynrd. The band has quickly risen to become one of the more popular bands at area clubs and festivals. The band has performed at events such as the Courtland Air Show, Relay for Life and has served as the opening act at Bogs and Boulders. The band is fronted by Steve Owen, a Decatur Parks and Recreation Department employee who many concert-goers will recognize as Concerts by the River’s lead sound engineer for the past 8 seasons. A gifted vocalist, Owen was inspired to start a band in 2010, with Double Shot being the result. In addition to Steve Owen, other band members include Ryan Miller, Ryan Issler, David “Gilby” Gilbert and dan Durham. Find out more information about Doubleshot on their Facebook page. Decatur, Ala. – Corn Day returns to the Decatur/Morgan County Farmer’s Market Saturday, July 14, 2012. From 9 a.m. to 1 p.m., free samples of freshly boiled corn on the cob provided by local farmers, along with butter, seasonings, and soft drinks, will be available for festival-goers. Whether you like it grilled, boiled, creamed, or roasted, plenty of freshly harvested corn will be available for purchase. The season for corn is only a few weeks, but the summer vegetable is excellent for freezing for year round consumption. Along with corn, there will be home-baked goods, flowering plants, and other fresh seasonal fruit and vegetables for sale. The Decatur/Morgan County Farmer’s Market, located at 211 First Avenue SE in Decatur, is open Monday through Saturday, 6 a.m. to 5 p.m. now through November 10, 2012. The Decatur/Morgan County Farmer’s Market also celebrates Tomato Sandwich Day on July 28th and Watermelon Day on August 11th. For more information on Corn Day, call Farmer’s Market Manager Burl Slaton at 256.476.5595. From classic rock to the blues, CROSSFIRE delivers a rocking sound that energizes the crowd! The band has performed at many festivals and venues and will keep the audience on their feet. 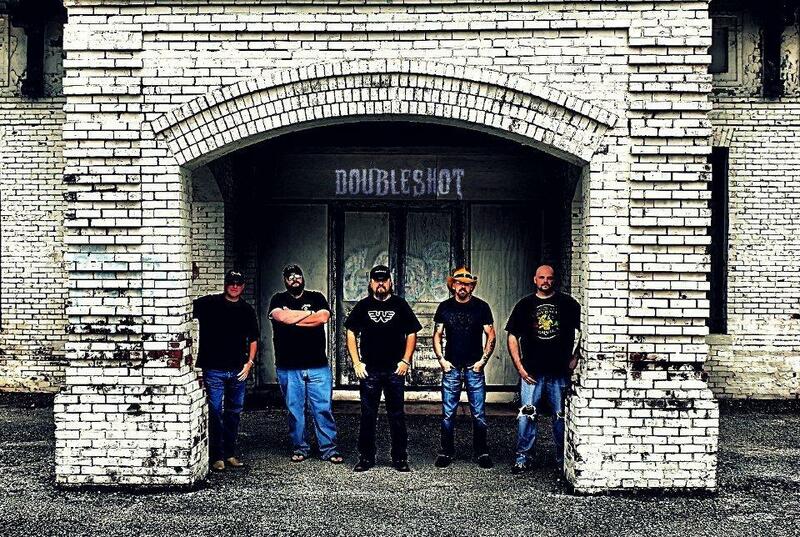 CROSSFIRE is composed of six musicians who have joined together to share their music with the great State of Alabama. Their lead singer, Paula Whitney, leads the band with her powerful vocals and is also a chef in her spare time. The rhythm section keeps the heartbeat of the band going with Gregg Taylor on the drums and Larry Johnson on the bass, When Gregg is not crushing the kit, he is providing weapon systems support for the Department of Defense. Larry Johnson stands 6’ 9”, and when he’s not booming on the bass he’s testing missles in his spare time. Rita Bell provides the harmony vocals and also plays the acoustic guitar. She spends her days as an accountant! Brian Decker wails on the electric guitar with his own style of riffs, his day job as an engineer has him supporting our troops in the field. Lisa Williams adds her vocals and electric guitar to keep the band going full steam ahead! Born on the 4th of July, she is Ms. Patriot and supports the soldiers with her engineering. Learn more about CROSSFIRE at www.crossfirerockson.com. Formed in 1973, the Madison Community Band is a true “community” band with members representing a variety of backgrounds and ages! The Madison Community Band boasts a broad repertoire of music, featuring both traditional and current concert band numbers. The band performs true concert band music including pop/show tunes, patriotic selections, marches, songs from musicals and light classical numbers. At their July 9 performance, the band will shake things up a bit and get the crowd involved in their performance of “The Chicken Dance.” They will also perform selections from The Phantom of the Opera and Mary Poppins. Band members are united in a shared love of great music, and participation in the Madison Community Band gives them the opportunity to continue to enjoy playing and being involved in a band setting. The Madison Community Band has grown from fifteen to sixty plus members, and also features an active solo and small ensemble programs. Smaller ensembles perform at corporate events, private weddings and social events, and community activities. The Madison Community Band is proud to provide great band music to residents of the Tennessee Valley! For more information on the Madison Community Band please visit www.m-c-b.org. Set for July 21, 2012, the Wet Dog Triathlon returns to Point Mallard Park in Decatur bringing with it approximately 600 athletes from across the United States and beyond. The race begins at 7 a.m. with a 400 meter swim in the Tennessee River followed by a 15 kilometer bike ride and ends with a 5 kilometer scenic run along the banks of the Tennessee River. The Ben Parker Project is slated to perform under the covered pavilion throughout the event as participants battle it out on foot, on bike, and in the water. The competition wraps up around 11 a.m. following an awards ceremony. Entry fees are $40 for individual, $100 for a team entry, and $90 for a family of three. Registration is available online at www.active.com (keyword “wet dog”) or a registration form may be picked up at the Big Brothers Big Sisters office before Wednesday, July 18th. Proceeds benefit Big Brothers Big Sisters of Morgan County. Last year, the Wet Dog Triathlon raised $12,000 for Big Brothers Big Sisters, a nonprofit mentoring organization providing guidance and support for the youth in Morgan, Winston, Cullman, and Lawrence County areas. Special lodging rates are available at Country Inn and Suites, Microtel Inn and Suites, and Best Western. Corporate sponsorships are still needed. For more information, contact Leah Brothers, executive director for Big Brothers Big Sisters, at 256.353.0157 or visit www.bbbsmcal.org.